QUITO, Ecuador -- Ecuadorian President Rafael Correa resoundingly won re-election with an unprecedented first-round victory in Sunday's elections. 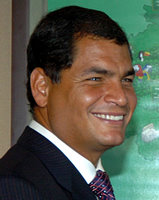 Running on the Alianza PAÍS (Country Alliance) ticket, Correa took an estimated 54 percent of the vote. His closest challenger, Lucio Gutiérrez, finished with an estimated 31 percent.